As a voracious reader with bibliomaniacal tendencies, I welcome any tool that helps me to manage what I’m reading and, perhaps more important, what I’m going to read next. 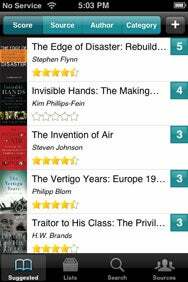 Rank and File: Next Read offers a easy-to-navigate interface for managing your reading list. But its ranking system system is inscrutable and difficult to customize. Next Read by Square Wheel Software is aimed at readers who find themselves struggling to remember the name of that novel a friend recommended the other day or the author of that fascinating new biography they heard about on BookTV. The app for the iPhone and iPod touch is in some ways elegant, but an imperfect solution for managing your reading—in short, a great premise stumbles in the exposition. Next Read’s interface is clean and reasonably simple to navigate, with a crucial exception (about which more below). You can sort your books by source, author, category and rating. I had been using YouNote ( ) to jot down and keep track of the names of books I would see at a store that I might want to pick up another time. Usually, I just take a picture of the book, tag it, and sort later on. Next Read doesn’t let you snap pictures, but if you have a Wi-Fi, 3G, or EDGE connection, the app will import the cover image from Amazon, if available. In fact, Next Read owes a lot to Amazon. You can import your wish list (but not your shopping cart), or other people’s lists. If you shake your device, Next Read will pick a random title from your list and show you related or similar works. And, of course, you can read book reviews and buy a book through Amazon. All of which leads to the question: Why not just eliminate the middleman and use Amazon’s free app instead? Because Amazon doesn’t know everything, for starters. Because Amazon’s app is almost exactly like the Web site, minus a few gizmos. And because Next Read has more organizational tools, some of which are more useful than others, which is more than can be said for Amazon’s app. Next Read’s most convenient feature is the Quick Add function, which lets you input a book’s ISBN. You can also add the title and author—you must add both, although you can simply enter the author’s last name and the first few words of the title. You can also share your lists with other Next Read users over your device’s Wi-Fi connection or by e-mail, which is a nice social networking feature. And Next Read’s developers win plaudits for including a notepad feature. The trouble with Next Read is its confusing and inscrutable rating system. Next Read wants you to rank your books. That’s fine. Setting priorities is generally a good thing. But the ranking system makes no sense. Whenever you add a book to your list, Next Read prompts you for a source, such as “from a friend,” “online,” or “just browsing.” A number—the default range is +1 to +3, but you can change the settings (sort of)—accompanies each source category. As far as I can tell, the numbers are entirely arbitrary. The only reason “from a friend” merits a +3 but “on the radio” gets a +1 boils down to the preferences of the developer. And the only way to remove a book from a list is to “zero it out,” rather than simply swiping and deleting as you would with other apps. That would be fine if you could change the source rankings easily, but you cannot. The developer says, “Recommendation sources are completely customizable, allowing you to tailor your own scoring system.” Sort of. The only way I could do it was by deleting the category and re-entering with a new rank. You cannot simply edit the rank number. But that still didn’t satisfy my question why I needed to apply a numerical ranking in the first place. For that matter, who cares whether you heard about a particular book from a friend, a radio talk show host, or some blog? Fanatics for trivial details might find the feature valuable, but I found it frustrating and mostly useless. A “completely customizable” scoring system, in short, should give me the option of no score at all. Bottom line: Next Read is a useful app for tracking your must-read titles, weighed down by a cumbersome and counterintuitive ranking system.